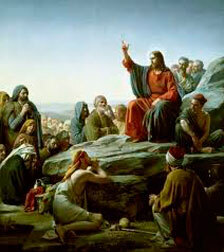 These words were spoken by Jesus as he taught the multitudes from the mountainside. Commonly known as "The Sermon on the Mount", this series of teachings includes the notable Beatitudes ("Blessed are the poor in spirit," etc.) and several other great discourses. It is not known if all these lessons were taught on a single occasion, or are a compilation of teachings that were presented on several occasions. But these couple of verses have come to speak directly to me in the last year. I don't know if you have begun to see the seeds of apostasy in your church yet----and if you haven't, be on your guard, because it's coming! Apostasy means "falling away from the truth." And for us Christians, the Truth resides in our Lord, Jesus, and his Word, the Bible. It may sound harsh, but lies have begun to seep into our faith. Self-professed Christians are introducing a "new truth" into our churches. Books are being printed and distributed and taught in our Churches that proclaim that "the old paradigm" of our faith has been replaced by a new, "emerging" paradigm. What does it mean in real terms? There is a new theology being introduced that suggests that the traditions of our faith are outdated and incompatible with a new "world view". They propose the theory that the Bible is not to be taken literally; that many of the principles and directives are metaphorical. This new paradigm also suggests that until his death on the cross, Jesus was just a man, not the Son of God. And even more alarming, those who believe in this "emerging" theology, think that Christianity is too exclusive! They ask Christians to consider that there are other ways to the Father, than through Jesus Christ. This post is not meant to bash other faiths or other religions. Each person must make his or her own choice as to who they will worship. But if you are going to call yourself a Christian, the only "manual" (so to speak) we have to go by is the Bible. And if we accept Jesus as our Lord and Savior, then we cannot pick and choose which of his words we will believe as Truth and which we will discard as metaphor or allegory. When He says, in John 14:6, "I am the way and the truth and the life. No one comes to the Father except through me", this is the narrow gate to which he refers in Matthew 7. To broaden this Scripture, or add to it, or misinterpret it is to lead others astray; this is the path to destruction. This new movement goes by many names; the Emerging Church, or the Emergent Movement, or the Future Church, and at this time, the movements have not combined into a cohesive camp. But they all appear to agree on their disillusionment with the organized church and lend their support for the deconstruction of modern Christian worship, modern evangelism, and the nature of traditional Christianity. I will admit that organized religion has had its problems throughout the centuries and hypocrisy runs rampant among the faithful. Yes, we are all sinners! But to encourage believers to go through the "wide gate" and stray from the core beliefs of our faith is to fan the flames of apostasy. And Jesus warned against that, too: "Watch out for false prophets....."
Good, timely post. This is happening all too frequently in even our most conservative churches. It is imperative that we be aware and on guard for this changing ideology, as it can slip in very slowly and gradually, often being lableled "compassion and tolerance" for those who believe differently than what the Holy Bible teaches. The sad thing was, I didn't want to believe that people I credited with encouraging me and helping my faith to mature were now leaning towards a new belief system that diminishes the Bible. Please, people, ask the Holy Spirit for discernment! Do not follow blindly!